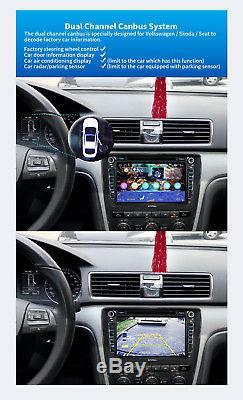 Android Autoradio Multimedia 8 Touchscreen GPS Navi WiFi DVD USB for Seat Golf. Amarok 2010+; Beetle 2011+; Caddy 2004+; EOS 2006+. Polo V 2009+; Sagitar 2006+; Scirocco 2008+; Sharan II 2010+. Tiguan 2008+; Touran 2003+; TransporterT5 2010+. Fabia 2007+; Octivia 2007+; Roomster 2006+; Rapid 2012+; SuperB 2008+; Yeti 2009+. Octa-Core 1.5Ghz CPU, 2G RAM and 32GB Flash + Google Play Stores for many Android apps. Integrated two-way CanBus decoder, which can display OPS / Radar / Climate Control / Reverse Trace. 1024 600 HD resolution with capacitive multi-touch screen control. Multi-languages: There are more than 50 languages to choose, please find it in picture. Built-in WiFi Modem, supports 802.11b / g / n wireless standard, high performance with low power consumption. Supports Google Maps Online Navigation, you can navigate the internet with Google Maps. Supports Android Maps Navigation, you can use the prepared offline navigation. Supports dual zone function, you can listen to music while navigating. Supports Bluetooth handsfree, built-in microphone and external microphone port. 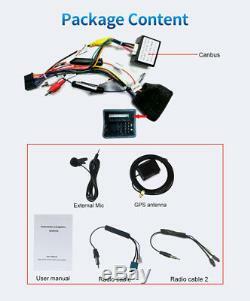 Supports OBD function (Torque Pro), you can connect with an ELM327 Bluetooth OBD2 scanner tool to use the function. Custom & EQ settings (User, Standard, Rock, Soft, Classic, Pop, Hall, Jazz, Cinema). JOYING reversing camera connection - with automatic switching function when reversing. Support for CD / DVD players. 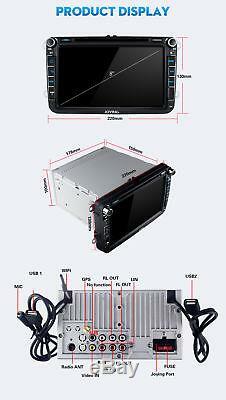 Online and offline GPS navigation system support. Output power: 4 x 41 watts. IPhone Zlink: Talk to Siri to make calls, use maps, listen to music, and access messages. The "SUB" port is no fucntion, if you want to connect subwoofer, you need to hook it up to the audio out with the red and white RCA at the bak of stereo. And there is no volume control of sub in the "Equalizer" App. The subwoofer volume will follow car stereo volume change. Optional equipment: Not included, but can also be ordered separately. Digital Radio Receiver DashCam Black Box DVR. Video Recorder Camera Bluetooth OBD2. Car radio with touch screen. 8 Inch TFT LCD touch screen monitor has a remarkable HD resolution of 1024 x 600 pixels, 4K format support. Power: 4x41W surround stereo EQ (Effect Compensation): User / Standard / Rock / Soft / Classic / Pop / Hall / Jazz / Cinema Built-in microphone in the control panel: Yes. AUX audio / video input: Yes USB front camera input: Yes Backward camera input: Yes USB maximum compatibility: USB port Supports USB flash drives up to 64G of storage space External Hard Drives: Up to 500GB GPS antenna input: Yes FR / FL / RR / RL Four Speaker Output: Yes. 1x External Micro 1x GPS antenna 1x user manual 1x connection cable with Canbus decoder 2x radio antenna adapter. Wenn Sie irgendwelche hilft bei Zahlung, bitte conact wir! Zahlung muss innerhalb 7 Tage nach der beendeten Auktion empfangen werden. So the carrier can contact you once they can not deliver the item. Unser Paket von DHL gesendet, und wir werden den niedrigsten Preis für Ihre Adresse zu wählen. In der Adresse, so Träger können Sie sich an, wenn sie können den Artikel nicht liefern. Wir Stellen 24 Monate Garantie für unsere Produkte. 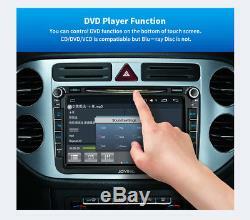 We focus on Android DVD Player with Good Quality, Lower Price. We will reply you ASAP. Wir sind OEM-Car DVD-Player / Radio-Hersteller, Wir setzen auf Android-DVD-Spieler mit guter Qualität, niedrigerer Preis, wenn Sie jede DVD-Player kaufen wollen, können Sie uns von Ihrem Automodell zu kontaktieren. Wir werden Sie so schnell wie möglich zu beantworten. We will Reply you ASAP. Weekend We Do not work , We Will reply you once we Back to work. Weekend wir nicht arbeiten, werden wir Ihnen antworten, sobald wir zurück zur Arbeit. L'item "JOYING Autoradio DVD CD GPS DAB OPS für VW Passat Golf Polo Touran Tiguan Seat" est en vente depuis le samedi 29 septembre 2018. Il est dans la catégorie "Auto, moto pièces, accessoires\Autoradios, Hi-Fi, vidéo, GPS\GPS, navigation\GPS intégrés". Le vendeur est "joykeepstereo" et est localisé à/en Bruchsal.